This industry report covers the email gateway market. Gartner, Inc. positions Gartner in the Leaders quadrant in its 2010 Magic Quadrant for Secure Email Gateways (anti-spam, anti-virus, outbound content filtering, email encryption, intrusion prevention). In this report, Gartner analysts note that, "The e-mail security market is very mature. Targeted phishing detection, outbound e-mail inspection, encryption and delivery form factor are the major differentiators." 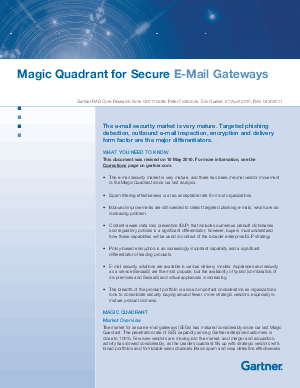 Please enter your contact information to view the complete Gartner Magic Quadrant for Secure Email Gateways 2010 report.